Marking the yahrtzeit of Rabbi Yaakov Reischer (6 Tevet), and recognizing the popular trend of adding prayers that come from mystical or otherwise esoteric sources, here is a translation of a segment of Rabbi Reischer's Shevut Yaakov (2:44). Bereishit is filled with haberdashery, from Eden chic to Esav's treasured garb, to Tamar's costume, to Yosef's palace ensemble. The clothing of Bereishit protects, conceals, deceives and honours. Perhaps the best-known clothing in this book, though, is Yosef's Amazing Technicolor Dreamcoat, a.k.a. his ketonet pasim. The talmudic logic seems to be that Yosef's brothers dipped his ketonet in blood to provide "evidence" of his death, and so the kohen's ketonet atones for bloodshed. This formula is odd on many levels, but here is a basic challenge: We are taught (Rosh haShanah 26a) that an entity which represents a person's criminality cannot also defend him. For example, the Kohen Gadol does not wear gold when he enters the Holy of Holies on Yom Kippur; gold is reminiscent of the Golden Calf. So how can the kohen's ketonet simultaneously recall the bloody deception surrounding the sale of Yosef, and yet atone for bloodshed? Let us look more closely at the sale of Yosef. The sons of Leah may have shunned Yosef because of Rachel. (Bereishit 37:2) They may have been turned off by Yosef's reports on their bad behaviour. (ibid.) Certainly, they were antagonized by Yosef's dreams. (ibid. 37:5-11) However, a passage in the Talmud (Shabbat 10b) contends that the sale of Yosef was actually triggered by two sela of wool, which marked his ketonet as unique. As depicted in that talmudic passage and in Rashi's commentary there, Yosef's ketonet was not luxurious, and the brothers would not have envied such a small difference. Rather, the brothers were outraged by the fact that there was any difference, that Yaakov had marked this son as holding a unique role that they could not share. In their eyes, setting Yosef apart was an unjust attack on their legitimate membership in the family. Long before the Enlightenment taught humanity to question received tradition regarding class and gender identities, Korach (Bamidbar 16) and King Uziahu (Divrei haYamim II 26) challenged the law that one must descend from Aharon in order to act as a kohen. Today, it is nearly universally axiomatic that "separate but equal" is unjust; as Justice Earl Warren wrote, separate is "inherently unequal." Our sense of fair play demands that human beings choose their destinations. Thus it is no surprise that Yosef's brothers would resent Yaakov's act of segregation, and that the Talmud would criticize it. On the other hand, separation is fundamental to Judaism. At the genesis of Creation, G-d separates light and darkness, land and sea, and He stresses that life forms are to exist "according to their species". G-d separates Avraham and Sarah from their family. G-d says of the Jews, "I have separated you from the nations" (Vayikra 20:26), and then He separates the Levites from the rest of us. (Bamidbar 8:14) How can we expect a humanity which resists segregation to respect a religion which sanctifies it? How can the same ketonet represent the flawed separation of Yosef, and the sanctified separation of the kohen? Perhaps a meaningful difference between flawed separation and acceptable separation is the identity of the Separator. As the Talmud Yerushalmi (Berachot 5:2) notes, establishing distinctions requires intelligence – and establishing distinctions which shape the lives of human beings requires the Supreme Intelligence of Hashem. Hashem is the One who distinguishes between sacred and mundane, between light and dark, between the Jews and the nations, and between the seventh day and the six days of creative activity. Realistically, life requires that we assign roles, defining confidants, spouses, political leaders, religious authorities, and so on. We need to define eligibility. But to the extent possible, we must respect the impact of distinctions, and practice humility, minimizing our meddling. G-d has assigned different roles to different nations, to different families of Israel, and to different genders; may we refrain from arrogating the power of segregation and creating novel restrictions and boundaries. May we channel our efforts into accepting our Divinely assigned roles, and fulfilling the tasks vouchsafed to us. This campaign is something my Beit Midrash developed with our local Bnei Akiva chapter, and it's been spreading on Facebook. 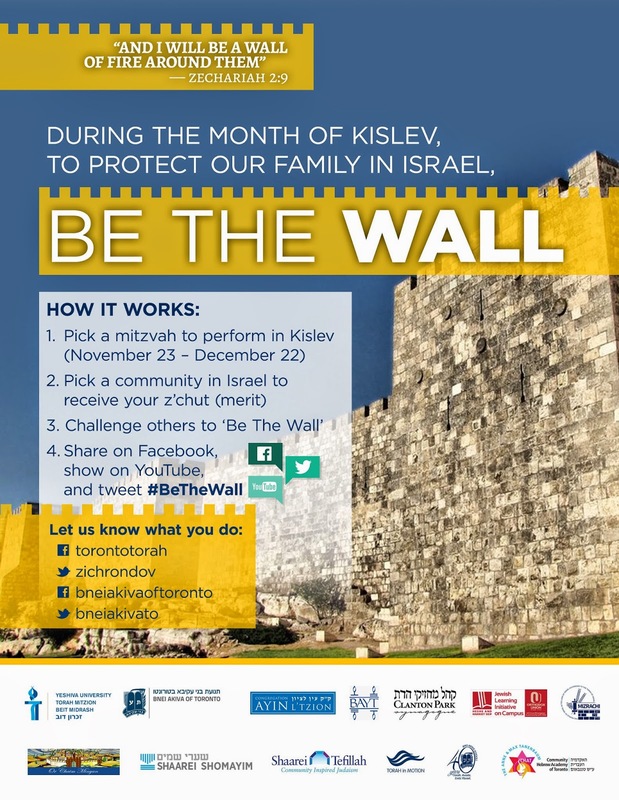 The idea, which is based on The Shmira Project, is simple: Take on a mitzvah practice for Kislev, and dedicate the merit to a community in Israel. I'm doing it, committing to extra care in my berachot, and dedicating merit to Gilo. If the project appeals to you, please join me. In an article titled "Rabbis on the Verge of a Nervous Breakdown", Jay Michaelson contends that the special political/emotional/psychological pressures of the rabbinate, coupled with the workload, could be one reason behind the regular appearance of scandalously poor decision-making by people who are trained to be wise, selfless community leaders. Per Dr. Baumeister, one of the key ingredients of self-control is "the capacity to alter the self." And he contends, citing studies, that someone who perpetually exercises self-control can actually deplete it, making it unlikely that he will be able to continue to apply self-control. In one study, "participants in various control conditions were exposed to similar stimuli but did not have to regulate their behavior. For example, they watched the same upsetting film without having to regulate their emotions, or they were permitted to eat the chocolates and cookies instead of the radishes. Afterward, we measured self-regulation in ostensibly unrelated other tasks, such as physical stamina on a handgrip exerciser, persistence in the face of failure on unsolvable anagrams, or refraining from laughing and smiling while watching a comedy video. The findings repeatedly showed that self-control was poorest among people who had already performed a prior act of self-control." Now imagine a rabbi who is involved with congregants on many diverse levels – pastoral, administrative, ritual, social, organizational – for 90-100 hours per week, including Shabbat. And imagine that yes, he owns impulses for grossly inappropriate behaviour. But he doesn't have daily time to flee the situation and recharge. How long will it be before he yields to a grotesquely wrong impulse? The uncomfortable reality, which I observed in my own synagogue rabbinate days, is that the job we have created for synagogue rabbis is impossible. Not "impossible" in the sense of "boy, that's hard". "Impossible" in the sense that there are not enough hours for them to do the job demanded of them, and recharge. Other life-cycle events - Bris, Pidyon haBen, Unveiling, etc. And contrary to popular belief, this is not subject to synagogue size. A smaller community will have fewer hours devoted to some of the items on this list, but that will be balanced by greater responsibilities in other areas. In a smaller synagogue, rabbis have greater administrative responsibilities, and greater roles in communal institutions. They also do the programming/promotional work which is managed by committees in larger synagogues. So yes – I'm not exaggerating when I say this is an impossible job. There is no opportunity to recharge the resources of self-control. 1. There are more rabbis than there are positions, and so a shul can create an unrealistic job description and find a dozen or more qualified applicants. There is no check on the Search Committee and its polls of the synagogue membership, and no one saying, "Does that actually work?" 3. Rabbis are heirs to a tradition that idolizes total dedication, as I discussed here. So I'd like to see the communities take the lead on recognizing the problem posed by their job descriptions. I once counseled a friend who was interviewed for a shul job that was advertised as 20 hours per week. I suggested that he ask the committee how they wanted the 20 hours used. As I sit here now, I think that would be a good exercise for search committees in general, before they ever see candidates – break down the hours of the week and see how they fit your job description. But I have written a lot on the Rabbinic Job Description over the years; click here for other posts on the topic. ...so why are November's poppies, marking Tuesday's Remembrance Day, relatively uncommon in the observant Jewish community? As I've written elsewhere, it seems to me that overt patriotism is somewhat “un-cool” in Torah-observant communities, in Canada and beyond. Perhaps this is a product of centuries of harm wreaked by a range of governments upon our people. Maybe it's due to Jewish law's insistence that the Jews should be "other" when living among non-Jewish neighbours. Or, it could be because of the way that those neighbours have marked us as "other" in painful ways. Despite all of the reasons why Jews may be uncomfortable with patriotic expression, I believe that Canadian Jews ought to clearly, publicly express our gratitude for those who have given their lives in the Canadian military. Whatever the misgivings of Pirkei Avot (1:10, 2:3 and 3:2) regarding government and its intentions, we owe a great debt to Canada's soldiers, for their historic roles and for their current actions. I believe we ought to wear the poppy. Within the realm of halachah, I have heard the contention that wearing a poppy may run afoul of the law of chukot akum, prohibiting dressing "in the manner of the nations", but a read of the relevant sources (Sifri Devarim 81, Maharik 88, Shulchan Aruch and Rama Yoreh Deah 178:1) makes clear that the prohibition applies only to (1) immoral dress and (2) dress worn for reasons which might trace back to idolatrous practices. Neither appears relevant in this case. The villianous people of Sdom attack the home of Lot and demand, "It is time for these guests to play their destined role," to suffer abuse at our hands! The Ayeh summons is not only a biblical call; ayeh is a summons for every human being, in every age. In the absence of visiting malachim, though, we are left to put the question to ourselves: where are we? And like the malachim, we know the literal answer, but the deeper question remains: where are we meant to be? Has our time come, is our destiny at hand, are we fulfilling the role for which we were created, and for which we are uniquely suited? May we not only ask the Ayeh question, but through our lives may we provide its answer. What's on my mind after Rosh Hashanah and Shabbos Shuvah? Of course, I know that there are real reasons for the schisms among our nation, and there are substantive issues of both philosophy and practice that divide us. All the same, I believe that naivete has an important place in our lives, in moving us from an ugly world to a more attractive one. Naivete regarding other people, naivete regarding Gd, naivete regarding ourselves. Let me be a cynic all year long, but not now, not in these weeks. More on this theme of naivete in the days leading up to Yom Kippur, I expect.